I’ve befriended a homeless guy. His name is Kenny – a Vietnam vet with family out of state, lived in his own apartment and worked decades for an aerospace company before retiring in 2012. At which time, for reasons that still aren’t quite clear, Kenny became homeless. He currently hangs out on the street by day and sleeps in his car at night. Homelessness, it seems, is everywhere. Not so many years ago, you’d have to travel to a place like Skid Row to see homeless people; now they occupy public spaces, freeway underpasses, riverbeds, even in and adjacent to many neighborhoods. Homelessness is a humanitarian tragedy leading to an increasingly dystopian future. The growth of homelessness has been dramatic. Los Angeles County has nearly 60,000 homeless people, to the extent you can actually count people who don’t have a permanent address; this represents an increase of roughly 30% over the last two years. Orange County has roughly 15,000 homeless, a 20% increase over the past two years. Think about that – somewhere close to 75,000 homeless people in Los Angeles and Orange Counties, most of whom live on the street rather than in shelters. So what happened? Poverty is certainly a big driver of homelessness; economic changes, the great recession and less public assistance certainly contribute. And then there is a chronic shortage of housing, especially affordable housing; data from REIS indicates average asking rent for a 1-BR apartment in Los Angeles and Orange Counties in the range of $1,700 a month, well out of reach for those with limited income. Drug and alcohol abuse certainly contributes to homelessness, and deinstitutionalization of the mentally ill has left many with no alternative but to live on the streets. Some estimates are that one third of the homeless are afflicted by mental illness. Homeless people can be characterized in many ways. At its core, homelessness can be defined by lack of stable housing, usually accompanied by extreme poverty. We can characterize the homeless by demographics – single adults, children, families, seniors and veterans; my friend Kenny falls into three of these categories. Homelessness can also be described as chronic, situational or cyclical. Or we can classify the homeless by how they got there – job loss, domestic violence, eviction, incarceration, substance abuse or mental illness. How have our institutions responded to the homeless crisis? From the public perspective, money and enforcement seem to the tools of choice. During the last election cycle, residents of Los Angeles County approved a 1/4¢ sales tax increase to fund homeless services, and the City of Los Angeles passed a $1.2 billion bond measure to build 10,000 units of housing for the homeless, accounting for more than half of the $430 million allocated to homeless funding in the city’s 2018-19 budget. While the first project funded by the city’s bond broke ground in East Hollywood in late 2017, proposals to build homeless housing in Koreatown and elsewhere have been opposed by local residents. 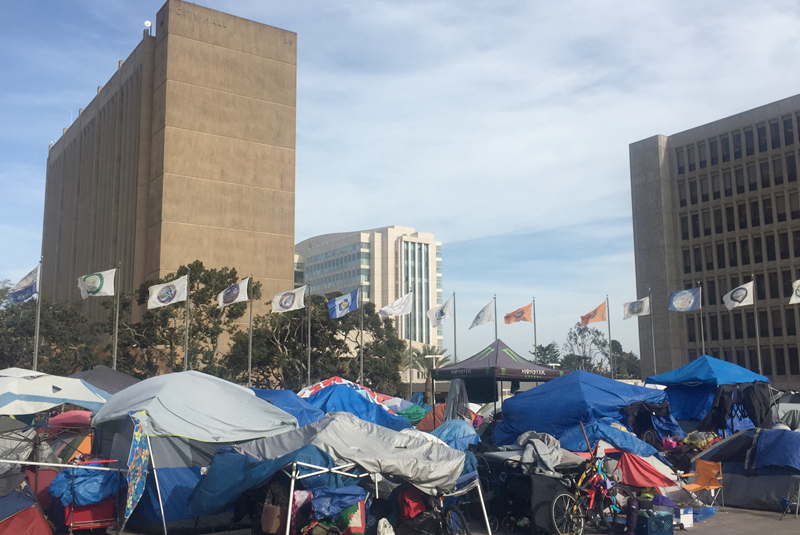 A recent report suggests a $73 million annual shortfall for the county’s comprehensive homelessness program, notwithstanding all the money approved by voters. Enforcement is the other weapon that is often used to combat homelessness. A good example is the recent eviction of nearly 1,000 homeless people who had taken over the Santa Ana River trail in Orange County. In the midst of the evictions in early 2018, a federal lawsuit was filed on behalf of the homeless, and a federal judge forced the county to come up with a solution. The solution was 30-day motel vouchers, which bought time for the county to propose building temporary shelters on county-owned land in Huntington Beach, Irvine and Laguna Niguel. The response from local residents was predictable, and the plan was rescinded, leading the judge to threaten to suspend local anti-camping ordinances. The temporary victory claimed by the cities, however, is just another manifestation of the regional failure on the part of the county to deal with a problem that demands immediate attention. The private sector, with very limited funds, has historically shouldered much of the burden of caring for the homeless. Non-profit institutions like the Los Angeles Mission, Union Rescue Mission, Long Beach Rescue Mission and Orange County Rescue Mission are well-known for the humanitarian work they do, along with numerous other shelters and food banks throughout the area. A friend of mine is actively involved with a non-profit board and care specifically for the mentally ill – people who would likely be homeless if not for that facility. Since this is no longer an abstract problem, what exactly can we do about it? Donate. Writing a check may not be the most personal thing, but it helps . . . a lot. Make it more personal by donating to a local charity, and getting to know more about what they do. Volunteer. A lot of people have a holiday tradition of helping to feed the homeless, but the needs are not confined to the holidays. The homeless problem is a year-round problem, and the need for volunteers is constant. Advocate. Put pressure on local government and elected officials to come up with solutions, and force them to exercise political courage to follow through. Importantly, hold them accountable for how they spend money and whatever results they achieve. Support housing. Nobody wants homeless people in their neighborhood, but they occupy our public spaces and some of our neighborhoods anyway. Shipping homeless people to the middle of nowhere, as some suggest, is not a solution. Homeless housing is going to cost taxpayer money, and eventually has to be built someplace. It’s far better for us to share the burden and decide where to locate homeless and supportive housing in our communities, than for us to ignore the problem as encampments continue to establish haphazardly. And the homeless have to accept solutions, including outreach and compelled treatment for those with serious mental illness. Homelessness does not confer a right to occupy public spaces and private property without permission . . . but it is up to us to provide a reasonable alternative. Just say “hello.” The homeless are marginalized in our society, and the simple act of engaging now and then might make their day. That’s how my friend and I met Kenny. I try to see Kenny at least once a week. If he needs something, my friend and I do what we can to take care of him. We’ve suggested some possible solutions, but for a guy living on the street, he is remarkably resistant to change. But he has personalized homelessness for me in a way that nothing else has before. We are understandably conflicted about homelessness. We might feel sympathy or compassion, while at the same time we are frustrated, often feeling disdain, revulsion, anger, and sometimes even threatened, but to continue to tolerate homelessness in our society is shameful. Ignoring the problem is no longer an option, and we all need to be part of the solution . . . our quality of life depends on it.